The doodle that Google today has come up with is an assortment of 35 doodles that appeared during the year 2012. ... into the arms of God we bestow this little jewel. Such nonsense abounds because Obama's objective in these negotiations is not economic but political: not to solve the debt crisis but to fracture the Republican majority in the House. Get Boehner to cave, pass the tax hike with Democratic votes provided by Minority Leader Nancy Pelosi and let the Republican civil war begin. It doesn't even matter whether Boehner gets deposed as speaker. Either way, the Republican House would be neutered, giving Obama a free hand to dominate Washington and fashion the entitlement state of his liking. ... time to call Obama's bluff. The real power over spending is in congress. Just say no. I would demand $2 in spending cuts for every $1 in tax hikes THIS YEAR and forget false promises of cuts that are ten years down the road. 'Six cities in Liaoning province, including Shenyang and Anshan, recently announced they are converting abandoned industrial sites to farmland. Dongguan, once a booming factory center, is on the verge of bankruptcy as companies close, leaving the local government severely cash-strapped. Fifth, the most important factors in eroding China's competitive position involved the labor force, the reason why foreign companies moved to the country in the first place. For one thing, the world's most populous country, paradoxically, began to run out of people. 'A couple of years back, Andrew Biggs of the American Enterprise Institute calculated that, if Washington were to increase every single tax by 30 percent, it would be enough to balance the books — in 25 years. If you were to raise taxes by 50 percent, it would be enough to fund our entitlement liabilities — just our current ones, not our future liabilities, which would require further increases. This is the scale of course correction needed. If you don't want that, you need to cut spending — like Harry Reid's been doing. "Now remember, we've already done more than a billion dollars' worth of cuts," he bragged the other day. "So we need to get some credit for that." ‘President Barack Obama made an opening bid in budget talks with Republicans that calls for a $1.6 trillion tax increase, a $50 billion economic-stimulus program and new power to raise the federal debt limit without congressional approval, a broad set of demands Republicans viewed as a step back in talks to avoid looming tax increases and spending cuts. Afghan teen reportedly killed after family refuses marriage proposal. FOX News: Whatever happened to the right to be left alone? article: Whatever happened to the right to be left alone?. Today the federal government is collecting $2.67 trillion in revenue ($330 billion short of the Clinton-equivalent) and is spending $3.76 trillion. Yes, that's right; we are spending $987 billion more than if we increased the last Clinton budget for inflation and population growth. It sure looks to me like spending is the main culprit. Former CIA Director David Petraeus stoked the controversy over the Obama administration's handling of the Libya terror attack, testifying Friday that references to "Al Qaeda involvement" were stripped from his agency's original talking points -- while other intelligence officials were unable to say who changed the memo, according to a top lawmaker who was briefed. "To me the question right now is who changed those talking points and why. ... I'd say it was somebody in the administration had to have taken it out," King told Fox News. "That, to me, has to be pursued." Obamacare is now here to stay. The United States will move inexorably toward socialized medicine, and the quality of health care for all will begin to decline irrevocably. Federal spending, which stands at its highest level since World War II, will stay right where it is and perhaps increase. Dependency on government will become better established as a way of life. Government will intrude in ever more creative and pernicious ways into the daily lives of Americans, as Obama rules by fiat to the greatest extent possible and issues regulations affecting myriad aspects of our lives. As more people become acclimated to receiving government largesse, fewer will be open to conservative ideas about self-reliance. Businesses will find it more difficult than ever to operate as the burdens of rules and paperwork weigh them down. Some within Republican circles will argue, in effect, "If you can't beat 'em, join 'em." That Republicans must moderate their message to appease a public that has rejected conservative ideas. But Republicans just did moderate their message. They ran Mitt Romney as their candidate. Conservatives will have to think not how to water things down, but how to sell their program to people who have failed to embrace it. You can define Obama by the fact that he lectured bankrupt Europe for not spending enough. Ironically, France lectured us about spending too much. Republicans were afraid that the tax and spend policies will hurt the economy, which they will, but they had a much bigger goal which was the repudiation of European style socialism. Because that failed, we have long past a tipping point where people will forever look to government to steal from their neighbors to get themselves freebies. The founding principle of this country where government doesn't interfere with your life is permanently dead. A commentator on the news remarked that the Hispanic vote played a big factor in the result, and further commented that Republicans have to stop alienating Hispanics, who he said are the fastest growing ethnic group. How are the Republican alienating Hispanics? By wanting the laws of this nation to be enforced. The logical conclusion of the argument is that the only people who can get elected are those who want open borders. The consequence of this, whether we like it or not, and whether it be good or bad, is that our culture will inevitably change. This is not the United States that I grew up in. That country has slowly disappeared. 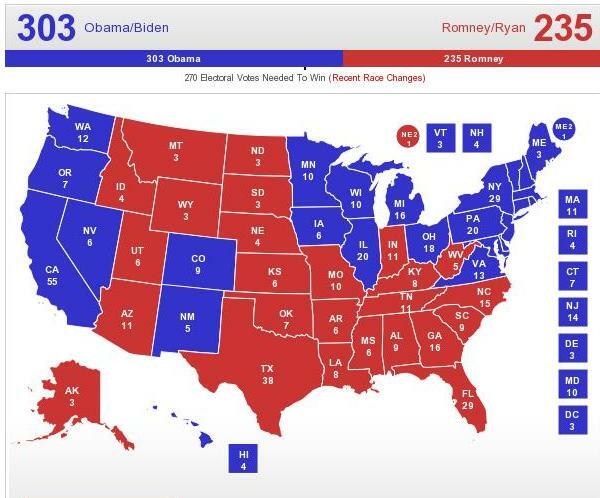 I am curious how the final map will compare with this predicted map. 'Israel will not outsource its vital security interests to anyone, "not even to our closes and most trusted allies," Defense Minister Ehud Barak said in London on Wednesday. "The State of Israel was founded precisely so that our fate would remain in our own hands. When it comes to the very future of Israel, and its vital security interests, we cannot… and will not outsource the responsibility for making the decision. Not even to our closest and most trusted allies," he said. '"You know President Obama hasn't really given us a vision for a second term agenda," he said. "Just a couple of days ago he came up with a slick new brochure. You know, with less than two weeks left to say, 'Oh I do actually have an agenda.'" As Ryan continued to mock the plan a man in the crowd interjected with his own description. "It is a slick – well, comic book, that was his word – to me a slick re-packaging of more of the same," Ryan said. "Now, Chinese TV programs constantly show the Japanese flag and a photo of my face," the ambassador said. "And the TV says in simple language that Japan is a thief who stole Chinese territory. Even elementary-school children can connect the flag, theft and my photo. In China, I am feeling like I'm the ringleader." Niwa said many Japanese volunteers teaching Japanese or working as caregivers, on a program by the Japan International Cooperation Agency, were also feeling a sense of great tension. The fundamental flaw of the pivot strategy was acknowledged by Campbell himself when he referred to the rising hostility between Japan and China, engendered of course by past and present factors but exacerbated by the pivot. We are worried that persistent high-level tensions are eating away at Sino-Japanese goodwill, at enormous linkages that have developed people to people, on culture, on business ... it is stirring negative feelings on both sides ... We recognize that damage has been done, and we're worried about it. 'Just how much oil and natural gas is at stake, in either the South China or the East China Sea, is unclear. The territorial disputes have prevented any reliable survey. One Chinese estimate puts the oil stores in the South China waters at 213 billion barrels, an amount that would exceed the proved reserves of every country except Venezuela (296.5 billion barrels at the end of 2011) and Saudi Arabia (265.4 billion barrels). That's about ten times higher than a U.S. Geological Survey estimate from the mid-1990s—but even that lower figure puts the South China Sea's oil potential at four or five times that of the Gulf of Mexico. (Related Quiz: "What You Don't Know About World Energy") Similarly, China estimates that one of the world's largest natural gas deposits, containing some 250 trillion cubic feet, lies all but untapped in the East China Sea. U.S. energy analysts reckon the "proven and probable" reserves there at only 1 to 2 trillion cubic feet—much less than the Gulf of Mexico, but still considerable. The U.N. Convention on the Law of the Sea gives countries the right to an exclusive economic zone extending 200 nautical miles from their coasts. In the seas off China and Southeast Asia, this rule leads to many overlapping claims, which in theory must be negotiated by the parties. China has been producing natural gas since 2006 from the Chunxiao gas field, located near a median line between the two nations that Japan has proposed (but China has rejected) as a maritime boundary. Japan suspects China is siphoning gas from Japan's side of the median. Those fears are fanned by China's refusal to share its seismic data. The Senkaku/Diaoyu islands lie southwest of that gas field, near Taiwan—which also claims them. Whichever country gets the islands would see its claims bolstered not only to Chunxiao gas, but also to untapped petroleum reserves that are believed to lie around the Senkakus and beyond. Japanese nationalists such as Shintaro Ishihara, who stepped down as governor of Tokyo this week to form a new political party, say the current national government has not acted aggressively enough against China. Earlier this year Ishihara began raising private money to take over and develop the islands as a way of cementing the Japanese claims. 'The National Ignition Facility in Livermore, California, has been called a modern-day moon-shot, a project of "revolutionary science," and "the mother of all boondoggles." NIF, as it's known, is a five-billion dollar, taxpayer-funded super laser project whose goal is to create nuclear fusion – a tiny star – inside a laboratory. But so far, that hasn't happened. The facility, which began operating in 2009 after a decade of construction at a cost of almost $4 billion, points 192 football-field-sized lasers at one tiny capsule the size of a peppercorn and filled with hydrogen. It creates degrees of heat and pressure never before achieved in a lab. China's foreign ministry has accused the New York Times of smearing the country by reporting that the premier Wen Jiabao's extended family has controlled assets worth at least $2.7bn (£1.67bn). A spokesman, Hong Lei, said the report "blackens China's name and has ulterior motives". Authorities have also blocked the news organisation's main and Chinese-language websites and banned searches for "New York Times" in English and Chinese on microblogs. "China manages the internet in accordance with laws and rules," Hong told reporters at a daily briefing when asked why the sites were inaccessible. The New York Times reported that several of Wen's close relatives had become extremely wealthy since his ascent to leadership. But in many cases their holdings were obscured by layers of partnerships and investment vehicles involving friends, colleagues or business partners, it said, in a detailed and lengthy account based on an extensive review of company and regulatory filings. A single investment held on paper by Wen's 90-year-old mother Yang Zhiyun – a retired schoolteacher – was worth $120m five years ago, the New York Times said. It added it was unclear if Yang was aware of the holdings in her name. The report is embarrassing not only for Wen himself – who comes from a modest background and is widely seen as the sympathetic, populist face of the government – but for the party. It is the latest in a string of unwelcome revelations about the vast wealth amassed by those around senior leaders. Fox News has learned from sources who were on the ground in Benghazi that an urgent request from the CIA annex for military back-up during the attack on the U.S. consulate and subsequent attack several hours later was denied by U.S. officials -- who also told the CIA operators twice to "stand down" rather than help the ambassador's team when shots were heard at approximately 9:40 p.m. in Benghazi on Sept. 11. Former Navy SEAL Tyrone Woods was part of a small team who was at the CIA annex about a mile from the U.S. consulate where Ambassador Chris Stevens and his team came under attack. When he and others heard the shots fired, they informed their higher-ups at the annex to tell them what they were hearing and requested permission to go to the consulate and help out. They were told to "stand down," according to sources familiar with the exchange. Soon after, they were again told to "stand down." Woods and at least two others ignored those orders and made their way to the consulate which at that point was on fire. Shots were exchanged. The rescue team from the CIA annex evacuated those who remained at the consulate and Sean Smith, who had been killed in the initial attack. They could not find the ambassador and returned to the CIA annex at about midnight. But first on his list was the danger of Romney filling seats on the Supreme Court. 'The bank attacks are remarkable because they seem unstoppable, even with advance warning. Just how bad are banks suffering at the hands of attackers? Rodney Joffe, senior technologist at Internet infrastructure provider Neustar, said the best some banks can do to prepare is to have a sincere-sounding apology at the ready, backed up with a plan B that points customers to an alternative method of communication such as a call center. "There is in fact no way to defend against it properly," said Joffe, who has helped banks try to recover from the attacks. "We can mitigate the attacks to some extent, but it is very difficult to keep systems up…This is one of our worst nightmares." 'The bankruptcy of electric vehicle battery maker A123 Systems earlier this week turned a spotlight on the struggles of the Obama administration's push for green jobs of the future around electric cars, which has fallen short in employment and production. Now a new report says in one Michigan plant, built with $151 million in federal money to assemble battery cells for the Chevrolet Volt, workers have been paid for months to do nothing. According to WOOD-TV of Grand Rapids, Mich., the 300 workers at the LG Chem plant in nearby Holland have yet to ship a single production battery cell since the plant opened late last year. While employees have built battery cells for testing, those were shipped back to LG Chem's home labs in South Korea months ago, leaving workers to do odd jobs around the factory, volunteer for community projects or just sit and play Monopoly. Several say training also stopped months ago, leading some employees to quit in frustration. The $300 million plant was launched by President Barack Obama in July 2010, at a bipartisan ceremony where Obama hailed the LG Chem plant and similar efforts by A123 as "jobs in the industries of the future," saying it was key for the United States to build not just more electric vehicles and hybrids but their batteries as well. The LG Chem's plant initial contract called for workers to build lithium-ion battery cells, 288 of which are used in every Chevy Volt -- and which are now made in South Korea and shipped to a GM plant in Michigan. The existing bilateral pact is known as a "suspension agreement" because the Commerce Department in 1996 halted an anti-dumping investigation against Mexico and negotiated a minimum price for imports of Mexican tomatoes. Business income is different from employees' income in another way. The profit that a business makes is first taxed as profit and the remainder is then taxed again as the incomes of people who receive dividends. The biggest losers from politicians who jack up tax rates are likely to be people who are looking for jobs that will not be there, because investments will not be there to create the jobs. Candidate Barack Obama publicly promises to go "line by line" through legislation to remove wasteful earmarks. Obama stimulus gave $200,000 to teach Siberian lawmakers how to engage Russian policy makers in Moscow. Stimulus funding of $250,000 went to bug storage for an insect museum at North Carolina State University that gets 44 visitors a year. Gave $500,000 to put microchips in recycling bins to check up on the recycling efforts of senior citizens. $5 million to create a geothermal energy system for the Oak Ridge City Center shopping mall in Oak Ridge, Tenn.
$9.38 million to renovate a century-old train depot in Lancaster County, Pa., that has not been used for three decades. Provided $712,000 spent on a project by researchers at Northwestern University to develop "machine-generated humor." Buses in Winter Haven, Florida that average two riders per hour got $2.4 million so that the two riders per hour would have brand new buses to ride on. A Georgia Tech assistant music professor got $760,000 so he could jam with "world renowned musicians" to "create satisfying works of art." The California Academy of Sciences got $2 million dollars to send people to the Indian Ocean to photograph ants. "Everyone has run into ants … now we need to listen to them," one ant photographer said. The University of North Carolina received $762,000 to create a YouTube dance application. $462,000 to purchase 22 concrete toilets for use in the Mark Twain National Forest in Missouri. $3.1 million to transform a canal barge into a floating museum that will travel the Erie Canal in New York. $3.4 million to create an underground turtle tunnel, or eco-passage, in Lake Jackson, Florida. About a half-million dollars to give smartphones to people trying to quit smoking so they could "contact their quitting support groups by text message or phone calls to prevent relapses." Almost $300,000 to study how Yoga might reduce menopausal hot flashes. $983,952 for street beautification in Ann Arbor, Mich., including decorative lighting, trees, benches and bike paths. $1 million for Portland, Ore., to replace 100 aging bike lockers and build a garage that would house 250 bicycles. $700,000 to Oregon crab fishermen to help recover lost crab pots. $1.5 billion for a Carbon Capturing Contest. $300,000 for a GPS-equipped helicopter to hunt for radioactive rabbit droppings at the Hanford nuclear reservation in Washington state. SUNY Buffalo received $390,000 to study young adults who drink malt liquor and smoke marijuana. Montana received $2.2 million to install skylights in their state-run liquor warehouse. $800,000 given to John Murtha Airport to repave a back runway used by about 20 passengers a day. This was in addition to millions given to this airport over the decades. $1 million was given to a Chicago dinner cruise company to "combat terrorism." $30 million for a spring training baseball complex for the Arizona Diamondbacks and Colorado Rockies. The Coast Guard gets $572 million to create 1,235 new jobs. This comes to $460,000 per job. $11 million for Microsoft to build a bridge connecting its two headquarter campuses in Redmond, Wash., which are separated by a highway. $1.15 million to install a guardrail for a persistently dry lake bed in Guymon, Oklahoma. $2.5 million in stimulus checks sent to the deceased. $6 million for a snow-making facility in Duluth, Minnesota. Millions spent on signs advertising the "American Reinvestment and Recovery Act." Barack Obama carries out much of the $700 billion TARP program. Obama forces banks to take money, and evenrefuses to accept repayment in some cases to wield control over them. The same kind of idiots that loudly booed the Democratic Party plank reinstating God andJerusalem as Los Angeles Mayor Antonio Ramón Villaraigosa agonized through three votes until he decided "in the opinion of the chair" that the yeas were shouting just a tad louder than the nays. It would have more accurate if he had said "in the opinion of the chair, the Marxists have lost." Then there is the popular video going around in which DNC delegates were asked if it was a bad idea for corporations and other businesses to make a profit and most of them said—wait for it—yes. This is Obama's base. Over the years I have grown less confident of polls taken in the run-up to Election Day. This is especially true when they suggest that only a few points separate one candidate from another. A successful incumbent President should have a recognizable margin of approval and, if he doesn't, that's usually a sign he's in trouble. Thomas Sowell: An Economic 'Plan'? Second Rebuttal: The financial crisis was caused by the housing bubble, which was fueled by government pressure on banks to lend to the less creditworthy. No president was more responsible for the housing bubble than Bill Clinton. Investor's Business Daily calls Clinton "the architect of the financial crisis," and likened him to a "housing arsonist" now trying to pass himself off as a "heroic firefighter." Obama likes to blame the financial crisis on deregulation. But the deregulation legislation in question was signed into law by Clinton, who also refused to regulate the complex financial instruments that helped transform the housing crisis into a financial crisis. Walter Williams: The Rich Don't Pay Enough? people who won't vote for him anyway. Thomas Sowell: Can Republicans Talk? 'According to calculations by FOX News analysts James Farrell and Mitch Kweit, taxing millionaires at 100% would now run the federal government for two and a half to three months. Specifically, the analysts took a crack at this question: "If you took all the adjusted gross income of all millionaires, how many months of federal spending would this pay for?" * 2009: For calendar year 2009, taking all the adjusted gross income of filers making $1 million or higher would have paid for 20.67% of all federal spending during calendar year 2009 – approximately 75 ½ days, or 2 ½ months. * 2010: For calendar year 2010, taking all the adjusted gross income of filers making $1 million or higher would have paid for 24.11% of all federal spending during calendar year 2010 – approximately 88 days, or nearly three months. The figures seem a bit deceptive, because being a millionaire is not limited to making a million per year. I am actually surprised that there are enough people making a million per year to run the government for 88 days. 'The tragic fate of Palestinian Arab refugees has always loomed over the Middle East conflict. The descendants of those who fled the territory of the newborn state of Israel in 1948 have been kept stateless and dependent on United Nations charity rather than being absorbed into other Arab countries so as to perpetuate the war to extinguish the Jewish state. The refugees and those who purport to advocate for their interests have consistently sought to veto any peace plans that might end the struggle between Israelis and Palestinians. They have refused to accept any outcome that did not involve their "return" to what is now Israel, an idea that is tantamount to the destruction of Israel. The Palestinian have gotten away with this irresponsible behavior because they retained the sympathy of a world that saw them as the sole victims of Israel's War of Independence. But the historical truth is far more complex. We will not arrive at peace without solving the refugee problem – but that includes the Jewish refugees. Justice does not lie on just one side and equal measures must be applied to both. The truth about the Jewish refugees is something that foreign cheerleaders for the Palestinians as well as the Arab nations who took part in the expulsion have never acknowledged, let alone refuted. As Ron Prosor, Israel's UN ambassador pointed out in his speech at the conference, what occurred after Israel's birth was nothing less than a campaign aimed at eliminating ancient Jewish communities. Arab leaders "launched a war of terror, incitement, and expulsion to decimate and destroy their Jewish communities. Their effort was systematic. It was deliberate. It was planned." 'In 1910 the British journalist Norman Angell published a book called "The Great Illusion". It's thesis was that the integration of the European economy, and by implication the global economy too, had become so all-embracing and irreversible that future wars were all but impossible. The book perfectly captured the zeitgeist of its time and fast became a best seller. In some respects, the early 20th century was a period much like our own – one of previously unparalleled global trade and exchange between nations. Human beings appeared largely to have outgrown their propensity to mass slaughter, and everyone could look forward to to a world of ever increasing prosperity. War, Angell compellingly argued, was economically harmful to all, victors and defeated alike. Self interest alone could be expected to prevent it happening again. Young men read the book in their thousands, mostly agreed with it, and then willingly marched to the fields of Flanders to take part in the most destructive conflict the world had ever known. When the First World War failed to resolve matters, they did it all over again in a second one. The historical parallels should not be stretched too far, of course, but the sabre-rattling from China over the disputed Senkaku islands contains some worryingly familiar themes. Sabre-rattling is hopefully all it will amount to. With the Chinese economy slowing fast, and a difficult leadership transition still to navigate, the frenzy of anti-Japanese feeling very much fits Beijing's domestic purposes. In a land without state-sponsored religion, nationalism is the new opium of the people. Even so, territorial disputes such as these have a nasty habit of spinning out of control. We've already seen some extreme positions adopted by both sides. In a number of Chinese regions, the military has been put on "combat readiness", while the Chinese Academy of International Trade has been vocal in calling for economic retaliation. The Chinese government says a breakdown in trade between the two countries would do Japan a lot more harm, adding that Japan relies on China to keep its economy afloat and to counter "irreversible" decline. ... and Mitt Romney keeps saying that he wants to stand up to China on trade. Everything Is Illegal In America - SHOCKING VIDEO ! What we don't understand about them, I think, is that this does affect a kind of core sense of their dignity and it affects their sense of whether or not we respect them. But I think at the end of the day, the West is in the right here. The United States is in the right. It is entirely inappropriate under any circumstances to use violence as a response to freedom of speech. The way you counter bad speech is with good speech. Let them make a great movie about Prophet Mohammed. That's the way you do it, not by killing people, not by burning people. The hot weather is over. So why isn't economic freedom the "default setting" for our economy? What upsets this productive state of affairs? Trouble begins whenever businesses take their eyes off the needs and wants of consumers—and instead cast longing glances on government and the favors it can bestow. When currying favor with Washington is seen as a much easier way to make money, businesses inevitably begin to compete with rivals in securing government largess, rather than in winning customers. The prevailing view now is that a nuclear Iran cannot be safely contained. On this point bothPresident Obama and Mitt Romneyagree. They can hardly say otherwise; to even hint that a nuclear Iran is acceptable would undermine the efforts aimed at preventing that outcome. But I tend to think they mean it. However, there are serious,thoughtful people who are willing to contemplate a nuclear Iran, kept in check by the time-tested assurance of retaliatory destruction. If the U.S. arsenal deterred the Soviet Union for decades of cold war and now keeps North Korea's nukes in their silos, if India and Pakistan have kept each other in a nuclear stalemate, why would Iran not be similarly deterred by the certainty that using nuclear weapons would bring a hellish reprisal? RealClearMarkets - Bernanke Revives "We're All Keynesians Now"
Although Obama has expanded the government more than any president since Lyndon Johnson, and arguably since Franklin Roosevelt, none of the prime-time speakers at the Republican convention labeled him "liberal."